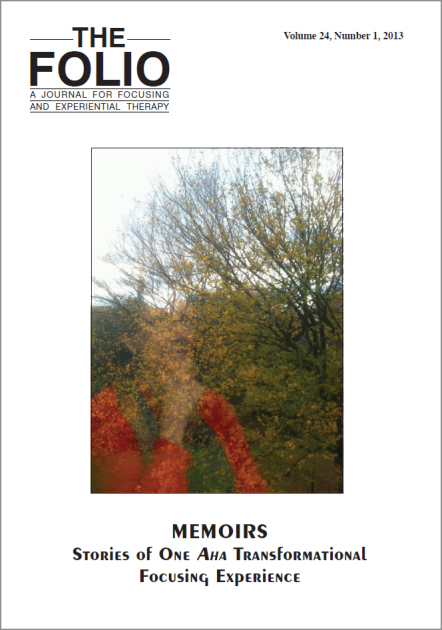 MEMOIRS: STORIES OF ONE AHA TRANSFORMATIONAL FOCUSING EXPERIENCE, features 47 written memories—memoirs from members of our Focusing community. The diversity of insight, growth, change, and inspiration is both heartfelt and often astounding. Some of the memoirs are very serious, of difficult and painful experiences that were transformed through the process of Focusing. Others are genuinely amusing and will make you smile from ear to ear. And, for the first time, some of the writers have included a variety of wonderful drawings and pictures, making this edition of The Folio particularly memorable, both visually, as well as in a felt way. To order the FOLIO please click on the box below that says: Choose FOLIO 2013 pricing. After you have selected the number of copies you want, please click on the "Confirm Selection" button. You will see a box on the right that will tell you the price of your order without shipping. To see the shipping rates click here. 14 Surviving College—Focusing Before and After: "How to Write an Essay Without Chewing Off Your Own Leg"
43 Focusing with "Baby On Board"
Rosie Fanale, APRN, RNC, M.Ed. 79 Transformations Through Focusing—For Client and Therapist! 82 Clearing the Fog . . .
Zena Goldenberg, M.A., M.S.W., L.C.S.W. 130 An Inner-Directed Life Awakens! John L Threadgold, B.A. (Hons) M.A. To get started, please click on: "Choose FOLIO 2013 pricing"